This is the most important method used in FlexDoc to obtain elements from the DSM (Data Source Model). A collection of elements is produced from the context element, according to a set of special Element Location Rules. Location rules are made of Location Paths, which themselves are used also separately for different purposes. Location Paths are the expressions similar to XPath, which are used in FlexDoc templates to specify the search of elements or attributes. Each Location Path is interpreted against a certain selected element (context node), which normally is the generator context element. 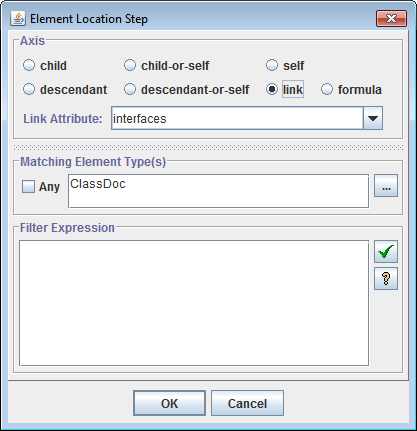 As the result of an interpretation, a set of elements (Element Location Paths) or attributes (Attribute Location Paths) is produced. The Location Path is interpreted by consecutive interpretations of all Location Steps defined in it. The interpretation of a Location Step consists of taking some initial set of DSM nodes (called step input set) and producing by it another set of DSM nodes (called step result set). How exactly it is done depends on the step's settings (see below). Those settings, in fact, specify how the step is interpreted against only one initial node. The entire result set is produced as a union of the result sets of the step interpretations against every node in the input set. The Step1 is interpreted against the Location Path's initial context node. Each StepN that follows is interpreted against the result set produced on the previous StepN-1. The result set of the last step becomes the result of the whole Location Path interpretation. If during the interpretation of some step an empty set was produced, so will be the result of the whole Location Path. Includes children of the step's context node. This axis is used by default (i.e. when no axis:: prefix is specified in the location step). Includes only the step's context node itself. Includes all descendants of the step's context node (i.e. its children, children of the children and so on). Includes the step's context node and all its descendants. 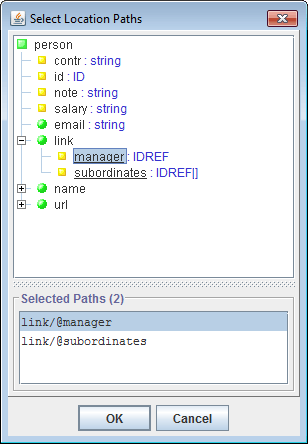 This axis, called link-axis, is an extension of the XPath standard introduced in FlexDoc. It includes those elements of the Data Source Model (which is a real or virtual XML-document) whose ID references are the values of the specified context node attribute. The attribute is the name of a certain context element's attribute (whose type should be either IDREF or IDREF). When the context element contains an attribute with 'attribute' name, all values of that attribute are interpreted as the identifiers of some elements contained in the DSM. Each identifier is used to find a corresponding element, and, if found, that element is added to the step's result set. This axis, called formula-axis, is another extension of XPath introduced in FlexDoc. In effect, it covers the functionally of all other axes and is probably the ultimate axis imaginable. The elements included in that axis are produced by a FlexQuery expression specified between the curly brackets. The expression should return an enumeration of new elements, which it may produce from the step's context node (the element) passed to the expression as the generator context element (accessible via the contextElement property). The real power of formula-axis is that you can program within the embedded expression any algorithms of collecting of elements (for instance, finding them using element maps). That profoundly transforms the capabilities of the entire search possible to organize using Location Paths! Note: The expression specified in formula-axis should always return the Enumeration type. Otherwise, the generator will raise an error. The returned enumeration should contain objects of GOMElement or DSMElement types (objects of other types will be ignored). When null value is returned, it is interpreted as the empty enumeration. A single Element Type name. The following expression: (ET1 | ET1 | ... | ETn), where each ETn is an Element Type name. This is a boolean FlexQuery-expression which defines the subquery for the location step filter. 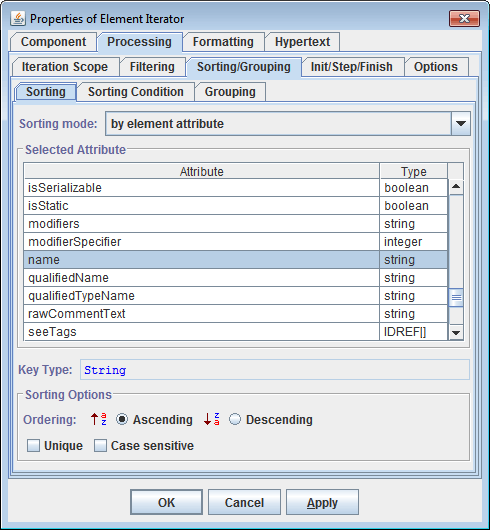 When specified, this subquery is executed for each element to be included in the step's result set. The element is included only when the subquery returns true. 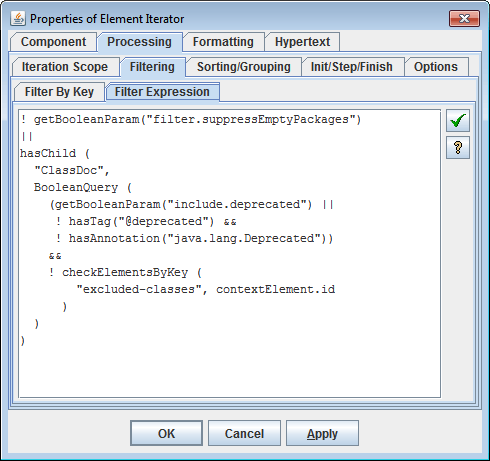 The tested element is accessible within the subquery as the generator context element (via the contextElement property). The previous context element is restored again after the Location Path processing is finished. where attribute is the name of the searched attribute. 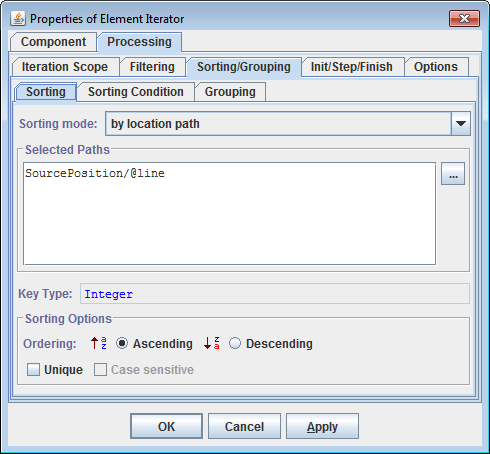 The Attribute Location Paths are normally used to collect values of the same attribute by a number of elements at once. The interpretation result of such a Location Path is a vector of all values of all attributes found. Such an expression is called Compound Location Path and interpreted by the successive interpretation of the Location Paths contained in it. The result is a union of the elements or attributes produced by each component Location Path. A boolean FlexQuery-expression that tests whether the rule should be interpreted against a given element. If the expression returns false the rule will be ignored. This is similar to the enabling condition of template components. The tested element is accessible within the expression as the generator context element (via the contextElement property). Location Rules are intended to be used not alone, but organized in vectors made of several Location Rules. A vector of Location Rules is interpreted against some initial (input) set of elements, which produces another (result) set of elements. An element from the input set is made the generator context element. The context element is tested whether it complies with any of the Matching Element Types. If matching condition specified, the context element must also comply with it (i.e. the condition subquery returns true). 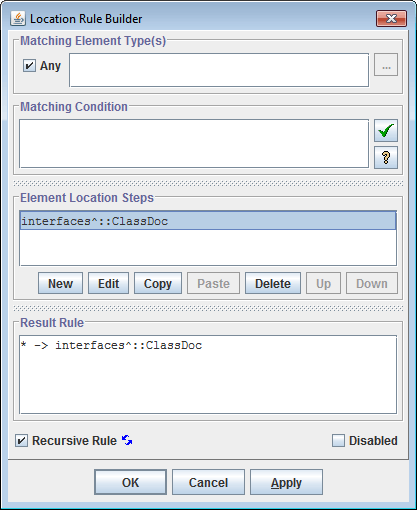 If all matching tests are passed, the Element Location Path specified in the rule is interpreted against the context element. The new elements produced by it are added to the result set. That everything is repeated for each element from the input set, so the complete result set is generated. From the description above you can see that the only way to specify searching of elements in arbitrary depth from a given context node is using one of the descendant-axes. At that, the search will involve all the element subtree attached to the context node. However, in some situations it may be needed to limit the search to only some branches of the subtree. 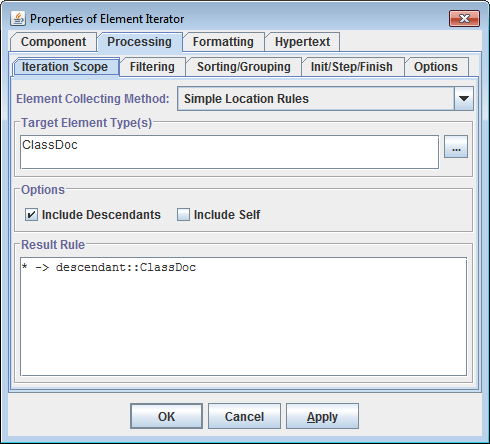 Constructing Element Location Paths using only descendant-axes may be not enough to achieve the necessary effect. Even more difficulties arise when the search in indefinite depth need to involve link- or formula-axes. That problem was solved in FlexDoc by introducing Recursive Location Rules. Recursive Location Rules are the same normal Element Location Rules, but in addition marked with a special recursive flag . This affects how such rules are interpreted. A vector of Element Location Rules that includes some recursive rules is interpreted in repeating steps. On each step, some new elements are produced, which are added to the result set. Those new elements become also the input for the next step and so on, until no new elements are produced. All the rules (recursive and not) are interpreted against the context element received by the Element Iterator as described in the previous section. As the result, some new elements are produced and added to the collected set. For the new element found on the previous Step N, all location rules marked with the recursive flag are interpreted again with each element successively selected as the rule's context element. That produces more new elements, which are also added to the collected set. Such steps are repeated until no new elements are found. FlexDoc distinguishes elements by their ID. Therefore, only those elements are considered the new ones whose IDs have not yet occured on the previous iterations. Such an approach helps to prevent the infinite looping when the processed elements contains cyclic references, however, it requires each element to have a unique ID. Let's consider a little more complicated version of the previous example. Now, the data source providing the information about a Java-project allows you to know a parent of each class (if any it has) and the interfaces the class directly implements. The rules should be interpreted with the interested class as the initial context element. The result set should be filtered for the elements of interface type. Specify one or many element types (TargetETs), which the elements included in the generated EIS must comply with. Specifies if the search should include all descendants of the context element. Specify one or many element types, which the elements included in the generated EIS must comply with. The FlexQuery-expression calculating the first element for the EIS. The calculation normally should be based on the context element received by the section and may involve other generator variables. All other EIS elements (except the first one) are calculated by this FlexQuery-expression. At each step, if the previous element was not null it is made the context element. Then, the expression is processed and the next element is produced. 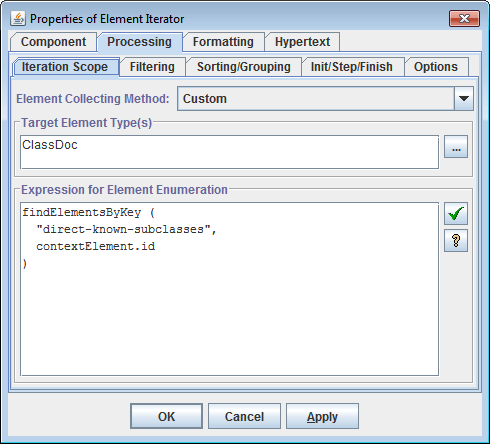 A FlexQuery expression that should return an enumeration of elements, which may be produced from the iterator's context element passed to the expression as the generator context element (accessible via the contextElement property). The expression should return the Enumeration type. The returned enumeration should contain objects of GOMElement or DSMElement types (objects of other types will be ignored). The null value returned by the expression will be interpreted as empty enumeration. Effectively, this method covers also all other methods above, since all possibilities to collect elements (including by Location Paths / Location Rules) are equally supported on the level of FlexQuery functions. Both methods can be used simultaneously. However, since in general these operations are not commutative, the Filtering By Key is always done the first. The idea of this filtering is the following. Each element is associated with a certain key produced from that element. The result (filtered) enumeration will contain only those elements, whose keys are unique. The elements from the original enumeration, whose keys are repeating, will be deleted. All elements from the source enumeration are iterated. For each element, a key is generated by the FlexQuery specified in “Expression for Unique Key”. The element is associated with that key. Using a special hashmap, the key is checked if it has been already associated with some element on one of the previous iterations. If not, the element is added to the result enumeration. If yes and the “Preference Condition” specified, it is executed against the current element. If the condition returns true, the element previously associated with that key in the result enumeration is replaced with the current element. Otherwise, the current element is skipped over and the processing goes to the next element. Specify a FlexQuery that will be execute for each initial element to generate the element's filtering key. The element is passed to the query as the generator context element. The value returned by the query should be an object good to be a hash key. The null value is also allowed. When you need to filter elements by several keys with different types so that only the whole set of keys generated for each element must be unique, you can do it by creating a single compound filtering key using HashKey() function. Specify a boolean FlexQuery that calculates the “Preference Condition” for the element. When specified, this query will be executed for each initial element whose key is repeating (that is, when there was an early processed element with the same key). The element is passed to the query as the generator context element. If the query returns true, the old element will be replaced with the current element in the result enumeration. 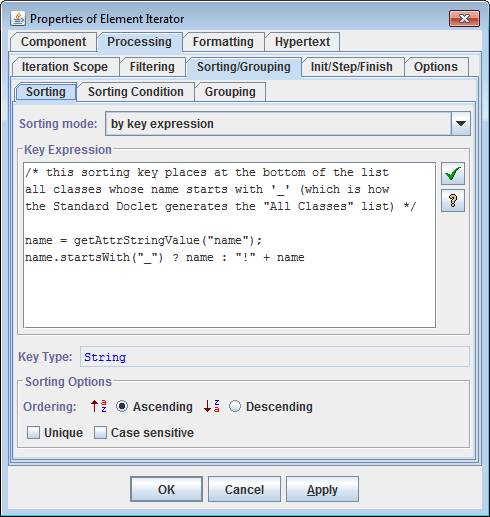 If the preference condition is not specified or returns false, the current element with the repeating key will be filtered out (removed from the result enumeration). Conversely, specifying in this field only "true" (which will be also a valid expression) will have an effect that for all initial elements associated with the same key only the last of them will appear in the result enumeration. This is what a normal filtering typically is. You specify a condition calculated for every initially collected element. 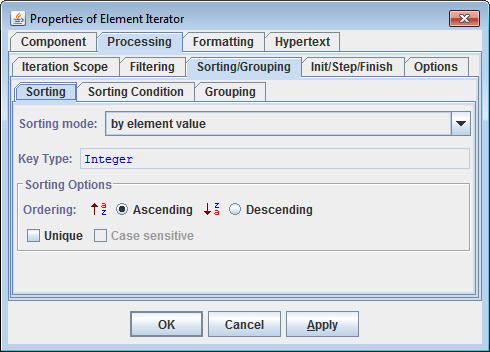 Only those elements that comply with the condition are included in the result Element Iteration Scope (EIS). Specify a boolean FlexQuery that will be processed against each initial element. If the query returns true, the element is included in the result enumeration. Otherwise, it will be skipped over. 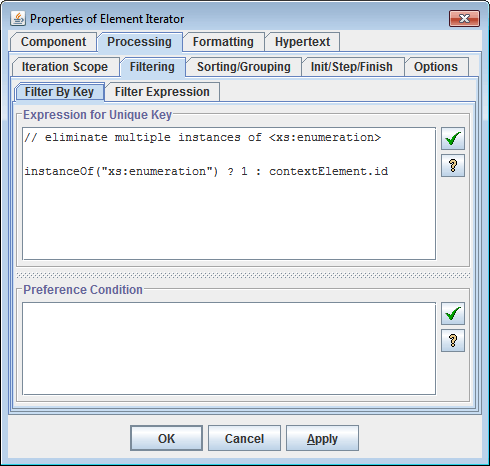 The tested element is passed to the query as the generator context element. No sorting. The EIS is remained in the original order (i.e. the one that is naturally formed when the elements are being inserted in the EIS). Reverses the original order. This option may be particularly useful when the EIS is generated by Sequence method. The elements of the EIS are sorted by the value of the specified attribute (according to its data type). The elements of the EIS are sorted by their names (i.e. the names of their Element Types) in lexicographical order. This option makes sense when the EIS contains many elements of the different types. This is the most general method of sorting the EIS. It includes all previous methods and allows much more, though it might seem a little complicated. In this case, the elements of the EIS are sorted by an arbitrary compound key generated for each element. that is generated for each element before the sorting. The compound keys are compared by comparing consecutively their constituent subkeys in the order in which the subkeys follow. Each subkey has its own method of calculation. This method also determines the subkey's data type, according to which the corresponding subkeys are compared. The value of the subkey is assigned from the value of an element or attribute retrieved by the specified Location Path. The Location Path is interpreted relatively to the EIS element for which the whole key is generated. The Location Path also determines the subkey's data type. The value of the subkey is calculated by the specified FlexQuery-expression, which also determines the subkey's data type. The expression should derive the subkey value from the EIS element for which the whole key is generated. For doing so, the element is temporarily made the generator's context element and in this way can be accessed from within the expression. Sometimes it is needed to switch off any sorting specified in the Element Iterator and let elements follow in their original order, as they have been produced. For instance, this can be requested via settings of some template parameters. This is controlled by the “Sorting Condition” – a boolean FlexQuery. When specified, it is calculated each time before sorting starts. When the query returns false, no sorting is done. 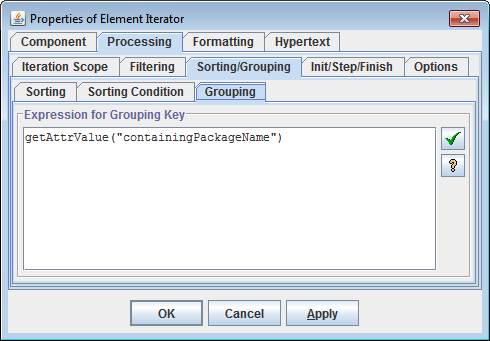 Using “Expression for Grouping Key” setting of the Element Iterator, you can break the iterated elements into groups so that to iterate first by the groups, and then by the elements within each group. When the grouping key expression is specified, it works as follows. After the initial elements have been collected, filtered and sorted, the result sequence of elements is broken into groups according to the grouping keys generated for each element by the FlexQuery specified in the “Expression for Grouping Key” of the Element Iterator. Each continuous subsequence of elements with equal grouping keys produces a group. 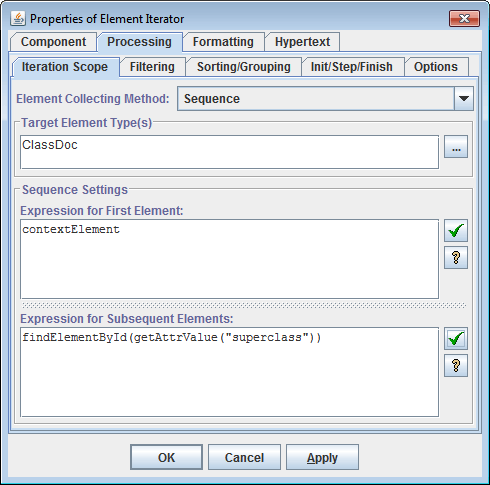 As a result, the sequence of elements prepared for iterations is converted into a sequence of element groups. The ordering of elements in each group remains the same as in the initial sequence. Since groups are not elements, the Element Iterator cannot iterate by them directly. So, it will iterate by the first elements taken from each group. However, at that, on each iteration step, the 'iterator.groupElements' property will be updated so as to provide the enumeration of all elements in the given group. 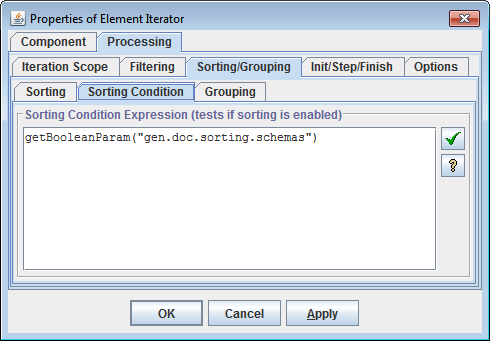 This allows you to specify a nested iterator that will iterate by the elements in the group. 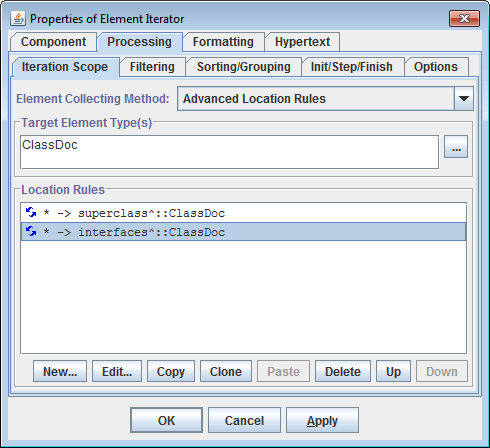 Other possibilities of using 'GOMIterator.groupElements' property are also available. The grouping keys slice the prepared sequence of elements into groups. But what groups are created is determined by the ordering of the elements in the initial sequence. So, grouping should be defined along with sorting! 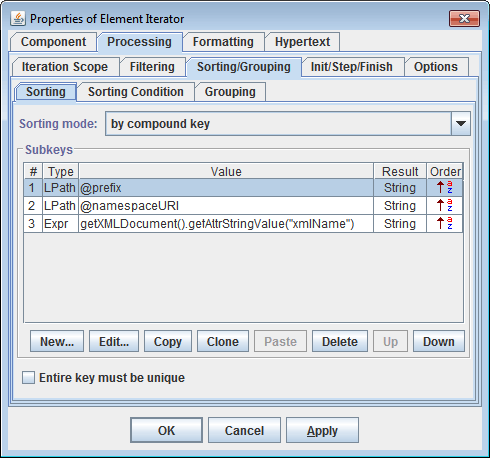 During processing of a group, the 'GOMIterator.groupElements' property returns a new element enumeration (i.e. a new java.util.Enumeration object) each time it is accessed. But, the elements contained in the enumeration will be the same. This allows you to specify several nested sibling Element Iterators (within the same parent one) to iterate the elements of the same group in different ways.